A premier guitar store in Oak Park has moved down the street to Forest Park, and its owner, Danche Ivanovic, said business is booming. Ivanovic ran his custom store, Danche Guitars, 906 Madison St., for about nine years, but as his business grew he needed a larger shop. After a frustrated effort to relocate in the Oak Park, Ivanovic purchased a building at 7232 Madison St. last year in downtown Forest Park. He said the foot traffic in the area, compared to the sparsely populated commercial corridor just east in Oak Park, has brought in a lot more customers. 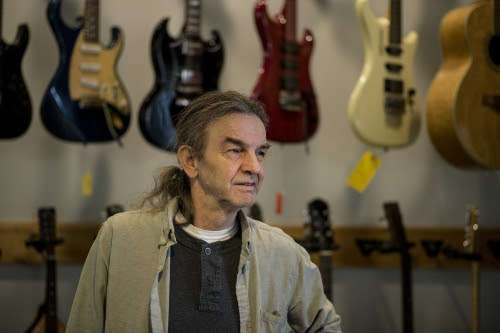 Ivanovic said the larger space – roughly 1,850 square feet and about twice the size of his previous storefront – has allowed him to offer more guitar classes as well as to become a certified dealer of Fender guitars. The shop has been open for about five months, but Ivanovic is holding a grand opening party tonight, Thursday, Jan. 14, from 7 to roughly 11 p.m.
Ivanovic will play at the event along with headliner Mike and Katie Hull Redmond. Ivanovic said his son, Goran Ivanovic, also will perform classical guitar pieces at the party.